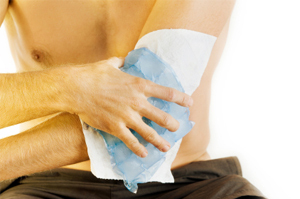 Tennis elbow, or lateral Epicondylitis, is the most common injury in patients seeking medical attention for elbow pain. Tennis elbow is caused by degenerative changes in the tendons that attach the forearm muscles to the arm bone at the elbow joint. These symptoms can be very debilitating. We have found treatment in the form of specific eccentric exercises and in some cases off loading the problem tendon (applying a support) to be very effective in aiding recovery for the majority of tennis elbow sufferers. We have experienced therapists specialising in elbow pain and injury in our Dinnington, Chesterfield and Doncaster clinics, contact us for an assessment.